The image is one of the most haunting in American folklore: Eleanor Dare cradling her infant daughter as they struggle through a vast wilderness, seemingly forgotten by her father who brought them to an unfamiliar land, then left them to fend for themselves. In the four centuries since their disappearance, Eleanor and Virginia Dare have become true American heroines, players in an epic unsolved mystery that still challenges historians and archaeologists as one of America’s oldest. In 1587, over 100 men, women and children journeyed from Britain to Roanoke Island on North Carolina’s coast and established the first English settlement in America. Within three years, they had vanished with scarcely a trace. England’s initial attempt at colonization of the New World was a disaster, and one of America’s most enduing legends was born. The lay of the land of modern Roanoke Island appears much as it did at the time of the colonists’ arrival. The low, narrow island lies between the treacherous Outer Banks and the mainland. Although it is influenced by the Atlantic Ocean, it is a verdant oasis compared to the harsh winds and pounding surf of the barrier islands. Instead, Roanoke is characterized by thick marshlands and stands of live oaks teeming with wildlife–a much more hospitable site for settlement. In 1584, explorers Philip Amadas and Arthur Barlowe were the first to set eyes on the island. 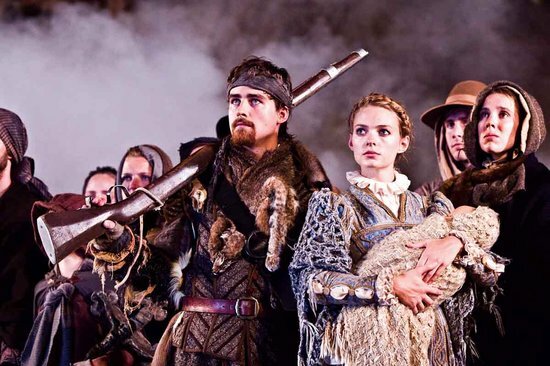 They had been sent to the area by Sir Walter Raleigh with the mission of scouting the broad sounds and estuaries in search of an ideal location for settlement. Amadas and Barlowe wrote glowing reports of Roanoke Island, and when they returned to England a year later with two Natives, Manteo and Wanchese, all of Britain was abuzz with talk of the New World’s wonders. Queen Elizabeth herself was impressed, and she granted Raleigh a patent to all the lands he could occupy. He named the new land “Virginia”, in honor of the Virgin Queen, and the next year, Raleigh sent a party of 100 soldiers, craftsmen and scholars to Roanoke Island. Under the direction of Ralph Lane, the garrison was doomed from the beginning. They arrived too late in the season for planting, and supplies were dwindling rapidly. To make matters worse, Lane, a military captain, alienated the neighboring Roanoke Indians, and ultimately sealed his own fate by murdering their chief, Wingina over a stolen cup. By 1586, when Sir Francis Drake stopped at Roanoke after a plundering expedition, Lane and his men had had enough. They abandoned the settlement and left behind a fort, the remains of which can still be seen at Fort Raleigh National Historic Site today. Ironically, a supply ship from England arrived at Roanoke less than a week later. Finding the island deserted, the leader left behind 15 of his men to hold the fort and returned to England for reinforcements. Raleigh was angry with Lane but not deterred from his mission. He recruited 117 men, women and children for a more permanent settlement, and appointed John White governor of the new “Cittie of Raleigh”. Among the colonists were White’s pregnant daughter, Eleanor Dare, his son-in-law Annanias Dare, and the Indian chief Manteo, who had become an ally during his stay in Britain. Raleigh had since decided that the Chesapeake Bay area was a better site for settlement, and he hired Simon Fernandes, a Portuguese pilot familiar with the area, to transport the colonists there. Fernandes, however, was by trade a privateer in the escalating war between Spain and England. By the time the caravan arrived at Roanoke Island in July, 1587, to check on the 15 men left behind a year earlier, he had grown impatient with the White and anxious to resume the hunt for Spanish shipping. He ordered the colonists ashore on Roanoke Island. 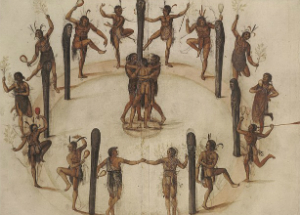 The colonists soon learned that Indians had murdered the 15 men and were uneasy at the prospect of remaining on Roanoke Island. But Fernandes left them no choice. They unloaded their belonging and supplies and repaired Lane’s fort. On August 18, 1587, Eleanor Dare gave birth to a daughter she named Virginia, thus earning the distinction of being the first English child born on American soil. Ten days later, Ferndades departed for England, taking along an anxious John White, who hesitantly decided to return to England for supplies. It was the last time he would never see his family. Upon his arrival in Britain, White found himself trapped by the impending invasion of the Spanish Armada. Finally, two years after the stunning defeat of the Armada, he again departed for Roanoke Island. He arrived on August 18, 1590–his grand daughter’s third birthday–and found the “Cittie of Raleigh” deserted, plundered, and surrounded “with a high pallisado of great trees, with cortynes and flankers, very fort-like”. 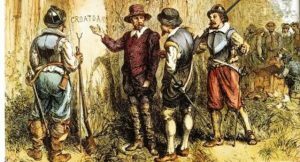 On one of the palisades, he found the single word “CROATOAN” carved into the surface, and the letters “CRO” carved into a nearby tree. Before he could make further exploration, however, a great hurricane arose, damaging his ships and forcing him back to England. Despite repeated attempts, he was never again able to raise the funding and resources to make the trip to America again. 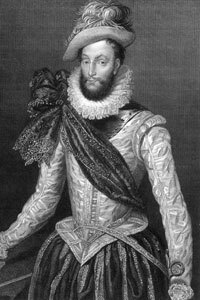 Raleigh had given up hope of settlement, and White died many years later on one of Raleigh’s estates, ignorant to the fate of his family and the colony. In the 1880s, with the approach of the Roanoke Colony’s 300th anniversary, a North Carolina man named Hamilton MacMillan proposed a theory that holds some credence today. MacMillan lived in Robeson County in southeastern North Carolina near a settlement of Pembroke Indians, many of whom claimed that their ancestors came from “Roanoke in Virginia”. According to MacMillan, the Pembrokes spoke pure Anglo-Saxon English and bore the last names of many of the lost colonists. Furthermore, “Roanoke in Virginia” was how Raleigh and his contemporaries referred to Roanoke Island. The Pembrokes also had European features: fair eyes, light hair, and an Anglo bone structure. MacMillan’s findings, published in 1888 pamphlet, gained a great deal of attention from the academic community and renewed interest in the lost colony. Other less plausible theories and some outright trickery surfaced in the mid-1900s. A series of mysterious rocks first uncovered in 1937 in eastern North Carolina seemed to solve the mystery. The original stone, dubbed the Eleanor Dare Stone, was found in a swamp 60 miles west of Roanoke Island by a traveler. 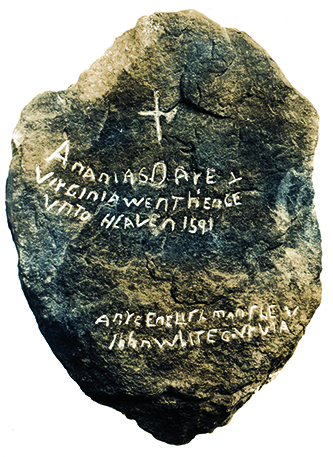 It was covered with strange carvings, which, when deciphered, appeared to be a message from Eleanor Dare to her father, indicating that the colony had fled Roanoke Island after Indian attack. Over the next three years, nearly 40 similar stones were unearthed from North Carolina to Georgia, and when pieced together, related a fantastic tale of the colonists’ overland journey through the southeast, culminating in the death of Eleanor Dare in 1599. Although the academic world was skeptical, the media had a field day and were forced to eat their words in 1940 when an investigative reporter exposed the entire saga as an elaborate hoax. In the past 40 years, scholars have discovered previously unknown records in the Spanish and British archives that may point the way toward a logical, if not provable, solution. Many historians now believe that after White’s departure from Roanoke in 1587, the colony split into two factions, and the largest segment of the colony departed for the Chesapeake Bay, their original destination. Lane had explored the Bay area in 1585, and the colonists probably had maps made by White himself. By 1612, the Jamestown leaders had received numerous reports that at least some of the Roanoke colonists were living nearby. They sent out several search parties, but had no success, and soon gave up the search. What became of the remainder of the colonists left on Roanoke Island? 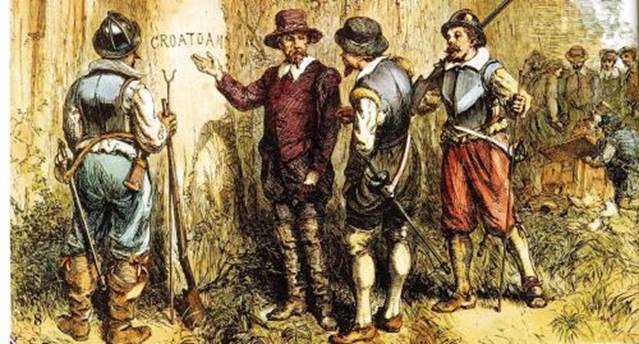 Scholars speculate that they were left behind to meet White upon his return from England, but soon fled to Croatoan, leaving the mysterious carvings behind as a signal to White. Spanish archives reveal that they were gone by June, 1588, when a raiding party put in at Roanoke Island only to find the settlement deserted. Scholars assume that they were then assimilated into the Croatoan tribe. Today, the north end of Roanoke Island is regularly visited by historians and archaeologists hoping to uncover new evidence as to the fate of the colony. So far, none has been forthcoming. The post and the tree bearing the carvings have long since vanished, although many of the live oaks in the National Historic Site were seedlings during the colonists tenure. No archaeological clues as to the whereabouts of the Cittie of Raleigh have ever been uncovered, and the 500-acre park remains mostly an enigma, apropos to the events that unfolded here 400 years ago. This article originally appeared in Reader’s Digest Books’ Explore America, Places of Folklore and Legend, 1997.